Revitalization of land using gabion retaining wall. 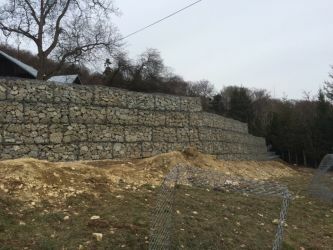 National Road Authority or National Motorway Company (NDS) contact us to speak about their specific project in Eastern Slovakia where they have recreation center: they wanted to make revitalization of land using gabion retaining wall. Gabions are formed from 0,5 thick gabion with galmac + polymer coating. To protect our solution in this proposal we put to design report also special type of ties – MacTie “U” and mesh opening of gabions 6×8. After some period NDS start the electronic tender. Company who won the tender directly contacted us because nobody was able to supply this type of gabions and ties. In order to protect our material, in the tender stage, we put to design our specifications of gabions and ties. This helped us to win this project. We are using this approach in Slovakia very often. After signing the contract, our commercial-technical team made a short instruction on jobsite in order to show how to install and fill the gabions. This approach is now established in every interesting projects. Gabions in recreation center are already built. We received pictures from construction company and they look very nice. The last point to close this successful business was to speak with NDS in order to find out if they were satisfied with our products. National Motorway Company (NDS) provides several very important and state regulated activities: in accordance of approved governmental program, NDS provides preparation and construction of motorways and expressways in Slovak republic. Within its competences and financial resources NDS provides adequate service to motorists. Many processes on the field of designing, land condemnation, construction and quantity survey are carried on by close cooperation with suppliers based on contracts, as a result of public procurement. They were very pleased with Maccaferri approach and with our technical and commercial support before and after construction. We hope that this good relations and clever success will help us in future to win other more interesting projects.